Exude status and prestige. For this reason, BeckerTime is proud to offer our selection of Rolex President mens platinum pre-owned watches sized 36mm. Currently, we offer a Rolex Day-Date Presidential piece with full diamond options and solid platinum diamond bracelet. We think you’ll agree, this watch is stunning for any occasion. Either way, we are confident that you will find a pre-loved timepiece that fits your style and budget. In addition, BeckerTime offers a 30-day money-back guarantee, as well as a Lifetime TradeUp Guarantee for qualified items. So, please contact us if we can help you find the perfect watch. Ever wonder about the story of your favorite Rolex? Well, stick with us. Let’s turn to a top watch that defines the Rolex brand, the Rolex Day-Date President. The Rolex Day-Date story is a bit ironic. On one hand, it’s certainly a luxurious watch with its precious metal case and bracelet, ironic water resistant traits, and chronometer certification. On the other hand, it’s undoubtedly the most customized watch ever produced. Factory and aftermarket dial variations abound. Diamond bezels were available right from the start. However, today jeweled bezels are available with every precious gemstone you can imagine. These include diamond, colored stone, or any combination thereof. It is possible to have a unique President that no one else on the planet is wearing. The Rolex Day-Date story began in 1956 as a last attempt at a somewhat complicated watch. Earlier attempts at complication, e.g. a moon phase, sat unwanted on dealers’ shelves. Interestingly, the Day-Date was a hit with its display of the fully spelled out day in an arcing window at 12 o’clock. Rolex introduced hacking in 1972. This convenient feature allowed owners to synchronize their watches with a known accurate time source and take full advantage of that chronometer-level accuracy. Subsequently, the first “quick-set” feature for President watches came along in the late 1970s. This new feature replaced the need to twirl the hands innumerable times just to get the day and date to line up. This coincided with the introduction of a sapphire crystal, which replaced the old plastic crystal. In fact, this new modification increased durability with scratch resistance and water resistance from 165 ft (50m) to 330 ft (100m). Double-quick set watches appeared in 1990. These Day-Dates allowed even quicker resetting of day and date at the end of most months. Rolex introduced the Day-Date II in 2008. Similar to the Datejust II, the 41mm Day-Date II is a larger watch than its older 36mm brother. In keeping with modern style trends, much of that additional real estate comes in the form of a wider bezel. The Day-Date Masterpiece is a 39mm version of the Day-Date. The Masterpiece is available in gold or platinum. 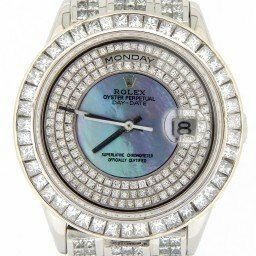 It features a diamond bezel and unique dials of mother of pearl, meteorite, and unique colors not used in other Rolex models. The bracelets are unique to the Masterpiece collection. They manufactured these in one, two, or three-color combinations of gold and platinum. So now you know about the first part of the Rolex Day-Date story. But back to the question we alluded to early on. How did the Day-Date come to be known as the President? 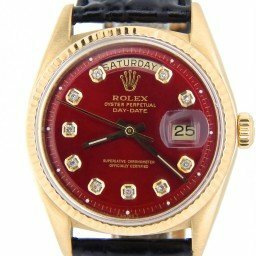 Well, Rolex reportedly gave one to President Dwight Eisenhower. But this watch has never surfaced. As we’ve discussed here before, Ike wore a yellow gold Datejust, which Rolex gave him in 1951. Also, Marilyn Monroe famously, but unverifiably, gave President Kennedy a Day-Date the year before his death. The watch exists, but no one has ever been able to tie it to either Kennedy or Monroe. In fact, the serial number on the watch in question apparently places its manufacture two years after the deaths of Monroe and Kennedy. It is well-known that Lyndon B. Johnson wore a Day-Date. Also, other world leaders have worn the watch. Rolex has called the familiar three-section link bracelet the President bracelet. However, they only referred to the watch as “The Rolex President” one time in a 1984 ad featuring sports agent extraordinaire, Mark McCormack. Thus, the Day-Date became The President. The Day-Date is already the brand’s most luxurious dress watch. And the platinum iterations are the most precious of the President watches. While there are some ultra rare platinum Rolex Day-Date watches like the platinum ref. 6612—the earliest known platinum Day-Date—and the ref. 1813 with an integrated platinum bracelet made especially for the Shah of Iran, here we’ll be focusing on more popular platinum Rolex Day-Date President models. The first thing to note about the platinum Day-Date President is that Rolex exclusively uses 950 platinum. As its label suggests, it consists of 95% platinum (and 5% ruthenium), permitting the material to be strong enough for watch construction while emitting its distinct luster. Another detail to consider on the platinum President is its bezel. Rather than the signature fluted bezels of the gold Day-Date watches, the platinum Day-Date President timepieces come with either a smooth bezel or a diamond-set bezel. This is to differentiate it from 18k white gold models since both metals are similar in color. Like other Day-Date watches, the traditional platinum President sports a 36mm Oyster case and distinguished President bracelet. Naturally, on the dial, there’s the iconic duo of windows displaying the day at 12 o’clock and date at 3 o’clock—hence the Day-Date name. A particularly famous dial of the platinum Day-Date is the ice blue dial. This specific shade of glacier blue is exclusive to platinum Rolex models. Therefore, it’s a quick and easy way to reveal the platinum construction of a Rolex watch housing the ice blue dial. In 1988, Rolex introduced the Caliber 3155 to the Day-Date collection allowing the two calendar functions to adjust independently from the hour hand. Dubbed the double quickset, this makes the Rolex President an especially practical everyday luxury watch. 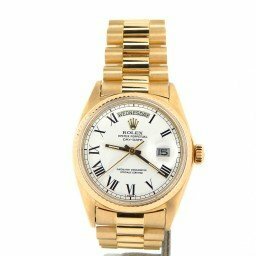 The platinum version of the Rolex President of that era was the mens Rolex Day-Date ref 18206. At the turn of this century during Baselworld 2000, Rolex unveiled the most current version of the Day-Date 36. Along with the gold varieties, Rolex presented the platinum Day-Date ref. 118206, which is the current model in Rolex’s catalog. Along with the ice-blue dial, there are so many dial options including a variety of colors, materials, and numeral styles. In addition to the ref. 118206 with the smooth bezel, there’s also the platinum Day-Date President ref. 118346 outfitted with a diamond bezel. There’s even a diamond encrusted platinum President bracelet option as well for ultimate lavishness. As with the gold Day-Date watches, there are also larger versions of the platinum Presidential watches. There’s the platinum Day-Date II ref. 218206 with a 41mm Oyster case, broader lugs, and overall bulkier look. Although it’s a great style for men searching for a larger version of the restrained 36mm size, Rolex ceased its production in 2015. It was replaced that same year by the more refined platinum Day-Date 40 model with a slimmer and smaller 40mm case.  The platinum Day-Date 40 ref. 228206 includes a smooth bezel whereas the platinum Day-Date 40 ref. 228396TBR shines bright with a baguette diamond bezel. The absolute king of luxury watches, nothing comes close to the preciousness and prestige of a platinum Rolex Day-Date President. This watch says it all without uttering a single word. If you’re going for high-level, you might as well go for platinum status! And while you’re here, we welcome you to view the stunning pre-loved selection of a Rolex President mens platinum timepiece here at BeckerTime.